When it comes to the smaller room air conditioners, there are two types. Split type and the Window/wall units. Split air conditioners consist of two parts, the indoor unit, and the outdoor unit. The outdoor unit generates the cold refrigerant which is then used by the indoor unit to cool the air. The outdoor unit uses a compressor and a fan cooled condenser to generate the refrigerant which is then sent to the indoor unit through ducting that runs from one to the other and back. The indoor unit runs the refrigerant through a cooling coil. The indoor unit blows air through the cooling coil which is what cools the air. The indoor units can come in the form of a cassette unit, which is usually ceiling mounted. Alternatively, the more common is the wall mounted duct type. Very large split units have floor standing indoor units. The other type is the window or wall unit. These are much more compact and entirely self-contained units that have no outdoor component. Window units are fitted into the wall and will be supported externally by a metal frame. These are used in older buildings and are not used as much now. The disadvantages of using these room air conditioning units are their lack of portability and the fact that they cannot be used as a spot cooler. Although they require regular maintenance and servicing, a rental portable air conditioner can be used during these periods to provide cooling. 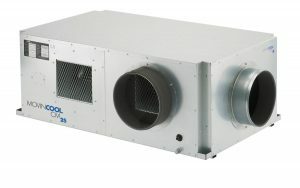 MovinCool is providers of industrial and data center cooling needs.